US equity indexes closed moderately weak, sp -2pts at 2437. The two leaders - Trans/R2K, settled lower by -0.7% and -0.6% respectively. 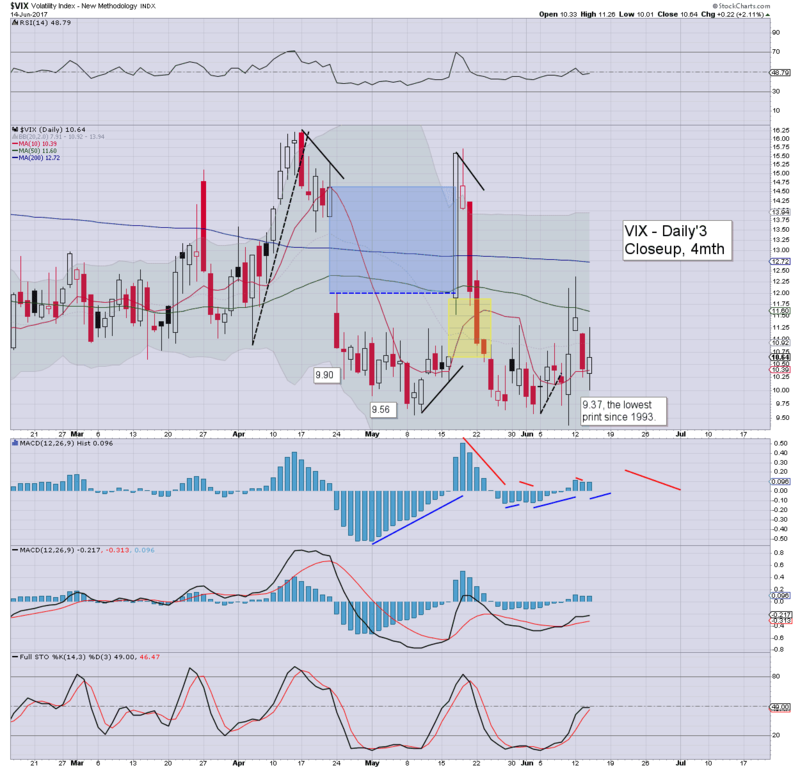 VIX settled +2.1% at 10.64. Near term outlook offers a washout in the 2410/2390 zone. Broadly though, the 2500s remain highly probable, no later than September. 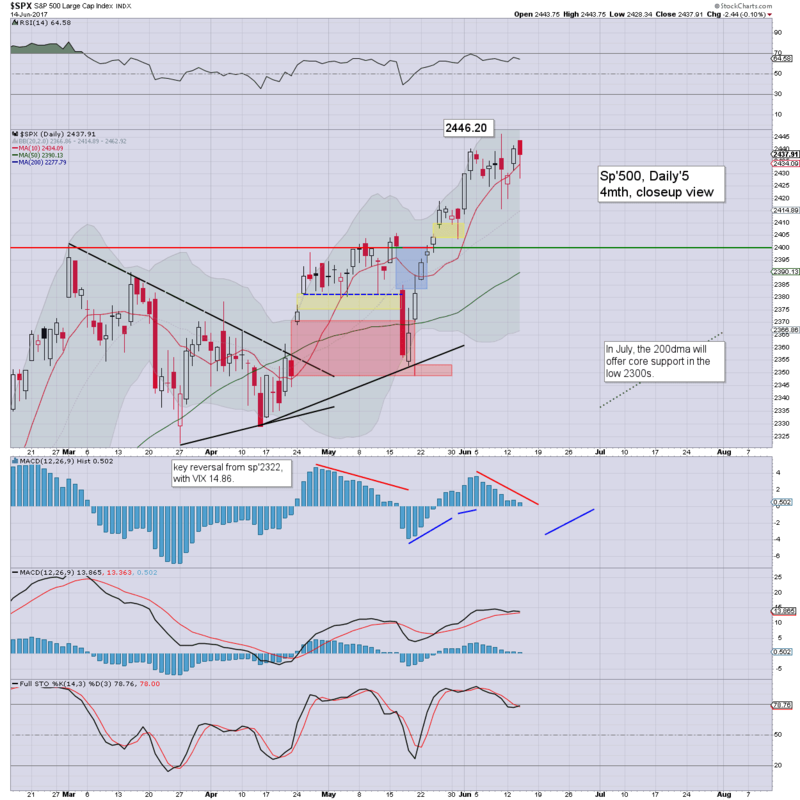 US equities opened fractionally higher, with the Dow and NYSE comp' breaking new historic highs. Yet.. there was a reversal from the open, and after a little micro chop with the press release from Print Central at 2pm, equities leaned increasingly weak. The closing hour saw an intra low of 2428, before a micro ramp to close fractionally lower. Volatility was mostly subdued, but VIX did see the 11s in the afternoon. The 13/14s look due if sp'2410/2390s by Friday. I was awake until sunrise last night, mostly due to watching a few live feeds of the London tower block fire. In the 1960/70s, the UK built a huge number of low quality tower blocks. The designs were absolute garbage, and it only took a few years for them to start decaying and become areas of utter social and economic horror. Last night's fire was at one of the recently refurbished ones. One of the trends is to cover the concrete with plastic coverings. Naturally (as also seen at 'The Torch' in Dubai), such coverings can catch fire, and spread like.. well, wildfire. Listening to some chatter last night, there was the common mistaken belief that such towers have sprinkler systems. No. Most don't, especially anything built before 1990. Even worse, the designs are such - as was the case with Grenfell tower, there is only one entry/exit. With at least a dozen having died, I'd imagine that particular tower will be torn down, along with many others in the coming years. Yours truly would prefer a literal bunker by the sea - much like the picture in the top left of this page. That remains a distant hope. Yours truly is battling hard to provide the most balanced appraisal and outlook out there.